The FCPA Compliance Defense: Yes or No? Should a company’s pre-existing compliance policies and good faith commitment to FCPA compliance be a defense when FCPA violations by its non-executive employees or agents are uncovered? This critical question has been hotly-debated by members of the business community, law enforcement and even in Congress in recent months as FCPA prosecutions against companies continue to surge. In this webcast, two of the leading commentators in the FCPA area--Professor Mike Koehler and Howard Sklar-present sharply conflicting opinions on this key issue. Drawing upon his just-released paper on the topic (“Revisiting a Foreign Corrupt Practices Act Compliance Defense”), Professor Koehler will argue in favor of Congress creating an FCPA compliance defense. He will explain why the unique aspects and challenges of complying with the FCPA in the global marketplace warrant a specific FCPA compliance defense and how the DOJ already recognizes a de facto FCPA compliance defense, albeit in opaque, inconsistent and unpredictable ways. On the other side of the issue, however, Howard Sklar contends that there are two overriding reasons why Congress should not include a compliance defense to violations of the FCPA. Sklar contends that corporations will not see any incremental benefit from making effective compliance a defense, and, moreover, that taking discretion out of the hands of the prosecutors will create unintended and adverse consequences that will more than offset any slight benefit corporations see. In short, he will explain how the end result of any FCPA compliance defense would be a weakening, not a strengthening, of corporate compliance programs. 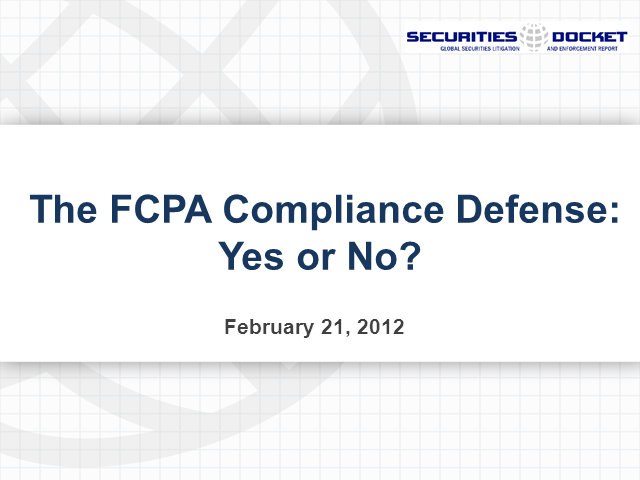 Title: The FCPA Compliance Defense: Yes or No?